The next in our graduate success story series is Alex Hughes, who had previously been featured on our official website showcasing a selection of our alumni. He has kindly agreed to answer the newly updated versions of our questions to update us on his life, work and study within the School of Music and Performing Arts. Alex studied with us for a BMus degree in Music on our Canterbury Campus, achieving an exceptional First Class Honours, with the culmination of his degree in 2013. As an undergraduate, Alex won prizes in the Kent and Sussex, notably the Freddy Kempf Millennium Award in 2011 and the Florian Williams Award from the Hastings Music Festival. An experienced choral accompanist, he has toured the UK and abroad with the Froncysyllte Male Voice Choir and Cantorion Rhos. 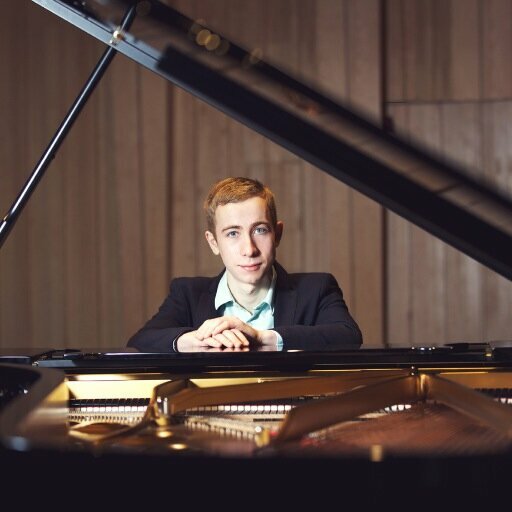 In the three years since leaving CCCU, Alex has continued to accomplish at the highest level, gaining an MMus from the conservatoire culture of the Royal Welsh College of Music and Drama on completion of his postgraduate study for his instrument – the piano. As a result of his hard work, he is now a sought after teacher, researcher and performer with a busy coaching and concert schedule – he has even returned to the School of Music and Performing Arts in a professional capacity, in order to perform in our lunch time concert series in St Gregory’s Centre for Music. I am currently Musician in Residence at Christ’s Hospital School in West Sussex. This involves a variety of responsibilities, such as piano teaching, academic teaching as well as being a House Tutor. I also sometimes find the time to practice! The fact that I am able to work with such talented and committed young people in wonderful surroundings. Yes, of course (the latter)! The old adage of ‘it’s not what you know, it’s who you know’ is still alive and well even today. Thus, you must be prepared to go out and network, make contacts, and get your name recognised. Moreover, having a reputable teacher will stand you in good stead, and can guide you in the right direction on so many levels. I was fortunate enough to study privately with Paul Roberts both in the UK and in France, whose modus operandi was that a reputable musician should be a well-read individual, familiar with poetry, art and literature. The answer is simple; hard work. Music differs from many other subjects that one can read at university. The primary reason being is that hours are often unsociable and working alone (pianists in particular) can sometimes be difficult. However, the final result is most certainly worthwhile, not only for you as an individual, but for the wider public. It (the course) made me aware of what I wanted to do in my career, and, allowed me to become an all-rounded musician. Living and working in one of the most famous cities not only in Britain, but in the world, was inspiring. Being surrounded by heritage and tradition is enough to inspire anyone. Also, being able to visit the Cathedral as often as you wish was a privilege.